A huge thanks to Mrs. Behan Gifford on the Sailing Totem website for including this tiny (but growing) website and blog in their Cruising Family Blogs section. This means our website is featured and there’s an RSS feed that will make sure all our posts update on their site automatically, sooo super cool. A bit about the Sailing Totem Crew- Totem is the name of their boat. Jamie and Behan Gifford and their 3 kids headed south from the West Coast of the US some 10 years ago, eventually circumnavigating the globe. With their oldest in college now, the rest of the family is still on the boat and now in Mexico somewhere (having finished their circumnavigation. They are regular guest speakers at various boat shows and Mrs. Gifford writes for SailFeed by Sail Magazine (one of my dream jobs). Her husband Jamie is called “the cruising sailmaker” as he will consult and help anyone order sails for their boat and the Giffords have a sailing consultancy business as well. 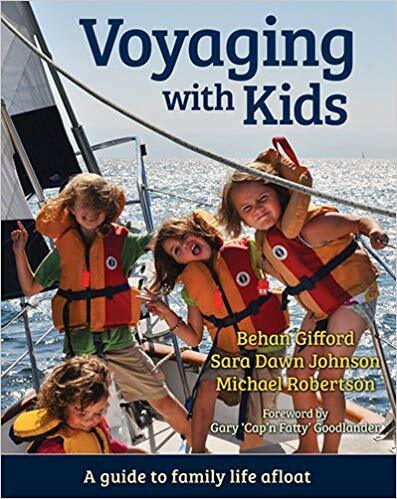 Behan Gifford has also co-authored one of the definitive texts about sailing and voyaging with kids, called Voyaging with Kids. The book is great but not yet reviewed on LF2SF because I haven’t finished reading it yet. If you hit the link to the Sailing Totem website and purchase the book, they’ll get a few Amazon pennies and totally deserve them for all the work done on the book and on the website. Thanks again to “Sailing Totem” for putting us on their site with RSS feed, that’s awesome! This is fantastic. Sailing Totem is a progressive and outgoing family team that I find very wholesome. I have a handful of sailing friends who have met the family and have nothing less than kind and thoughtful remarks about the family. Good on them and Good on you. I’ve enjoyed observing your growth.